This summer, as usual, I set up some solar dye pots with my granddaughter, who is now 8 years old and becoming quite an experienced natural dyer. 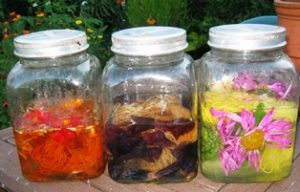 In a way, I feel the term “solar dyeing” is a little misleading, because many dyes, particularly leaves and flowers, will give their colours quite well without heat, including heat from the sun. Indeed, in many British summers the sun rarely appears and when it does it often gives very little heat, but the dye pots still produce colour. 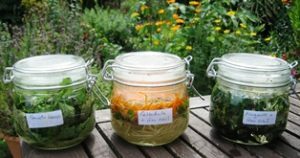 I have even had good results from pots set up with dye and fibres in the depths of winter, including those winters when some of the solutions have frozen during the process. For these dye pots, I simply put the dyestuff and an alum-mordanted skein in the jars and filled them up with water. For colour variations, I added iron nails to some of the jars and then made sure all the ingredients in each jar were below the surface of the liquid. As the weather was warm, I used cold water but adding hot water to start with will speed up the process if the weather is cool. I checked the development of colour on the skeins at regular intervals and removed the skeins when I was satisfied with the depth of colour achieved. I then added a second skein and repeated the process. The water may occasionally need topping up but otherwise all one has to do is wait for the results. These pots contain, from left to right: tomato leaves, calendula flowers with iron nails and mugwort leaves with iron nails. Some of the pots (eg. cosmos and aster) had already produced bright colours in a week or so, while others (eg. helenium dead heads and tomato leaves) took longer to develop a reasonable depth of colour. 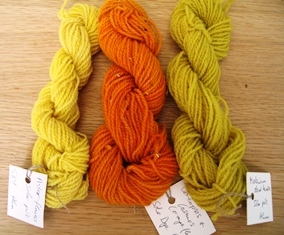 Below are some of the results on alum-mordanted wool . Note: Although I am reluctant to reveal the disappointing colour from the hollyhocks, I feel I must do so, as I suspect I will not be the only one to have had disappointing results from deep red hollyhock flowers. In general, I tend to use mainly the traditional, reliable dyes, with good fastness properties, especially if I am producing items for sale. 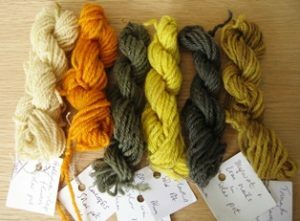 I don’t include hollyhock flowers among these reliable dyes, as they can be very fickle in the dye pot; sometimes they give pink and purple shades, sometimes they give soft greens and then at other times they yield only beige and dirty lemon tones. I have tried various methods: freezing them, drying them, applying heat and cool dyeing and it seems no method can be guaranteed to regularly produce pinks or purples. So the colours from hollyhock flowers shown in my book, “Wild Colour”, are sadly not the end of the story and I apologise if they have led too many dyers down the road of disappointment. If it is any consolation, it is a road I have also sometimes traversed!